collectSPACE - news - "The legacy of space shuttle Atlantis"
June 2, 2010 — As space shuttle Atlantis touched down last Wednesday after flying what was scheduled to be its final mission, a NASA commentator narrating the landing from Mission Control evoked the orbiter's legacy. "Space shuttle Atlantis now comes home to the Kennedy Space Center for the final time, 25 years, 32 flights, and more than 120 million miles traveled," spokesman Josh Byerly remarked from his console in Houston. "The legacy of Atlantis, now in the history books." If the STS-132 mission was indeed Atlantis' last -- an "if" due to the chance that it could still fly again, either as the rescue vehicle for the final scheduled space shuttle flight or should officials decide to add another mission, then the fourth orbiter to enter NASA's fleet will be the first to retire safely from service and in turn, the first to have its full, as planned and flown history tallied and recorded. About eight hours before STS-132 commander Ken Ham brought Atlantis to a "smooth as silk" landing at 8:48 a.m. EDT (1248 GMT) on Wednesday, May 26, the orbiter logged its 120 millionth mile, a milestone that Ham called "pretty darn awesome." The final reading on Atlantis' 'odometer' after its 32nd flight was 120,650,907 miles, approximately the same distance as 505 flights from the Earth to the Moon and back. The space shuttle wasn't designed to leave Earth orbit, so Atlantis racked up the miles while circling the planet 4,648 times. Traveling 5 miles per second, it flew through those almost 5,000 sunrises and sunsets in the course of 293 days, 18 hours, 29 minutes and 37 seconds spread over a quarter century. The fourth of NASA's five vehicle fleet to be built and fly, Atlantis, also referred to by its orbiter vehicle designation OV-104, made its first launch in October 1985, five years after its construction was initiated. Atlantis' 32 missions began with STS-51J, the first of its five classified flights dedicated to Department of Defense payloads. It flew two flights to deploy a total of four communication satellites, twice to study atmospheric science and once to test a tethered satellite system. Atlantis lived up to its namesake, the two-masted primary research ship for the Woods Hole Oceanographic Institute from 1930 to 1966, by setting sail to launch two planetary probes: Magellan to Venus and Galileo to Jupiter. It also deployed the Compton Gamma Ray Observatory and flew the final servicing mission to the Hubble Telescope. 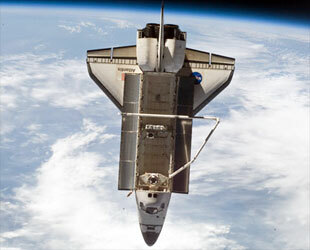 The bulk of Atlantis' time in space though, was devoted to visiting and assembling space stations. After making the first-ever shuttle docking to Mir in 1995, Atlantis proceeded to fly to the Russian space station six more times. It followed that record and ended its flying career docking to the International Space Station 11 times, delivering the the U.S. Destiny module and the Quest airlock in 2001, several of the "backbone" truss segments, the European Space Agency's (ESA) Columbus laboratory, and lastly on its final planned flight, the Russian Mini-Research Module Rassvet. Tallying Atlantis' missions and miles is simple compared to its crew members, as the count changes based on who or what it is being counted. A total of 155 unique individuals rode on Atlantis over the course of its 32 missions, but because it sometimes flew crew members arriving and departing Mir and the ISS, not all of them launched and landed on OV-104. NASA astronaut Clay Anderson, as well as ESA astronaut Leopold Eyharts and Russian cosmonauts Nikolai Budarin and Anatoly Solovyev only launched on Atlantis, returning to Earth on other shuttles or Soyuz spacecraft. Similarly, NASA astronauts Nicole Stott, Daniel Tani and Sunita Williams, as well as Roscomos' Vladimir Dezhurov and Gennady Strekalov only landed with Atlantis. Thus, only 146 men and women both launched and landed aboard Atlantis. Some of those people however, were fortunate to ride with Atlantis more than once. Taking them into account, 203 total seats were filled over Atlantis' 32 missions. Astronaut Jerry Ross holds the record for the most flights aboard OV-104 at five (he is also tied for the most shuttle missions at seven). "Obviously, it is my favorite space shuttle," shared Ross. "Atlantis really is a great flying bird." The day before returning Earth, Atlantis' final crew paused to share thoughts and memories about their spacecraft. "Atlantis is just a fabulous ship," said pilot Tony Antonelli. "She was a fabulous ship in the beginning and continues to be absolutely amazing." 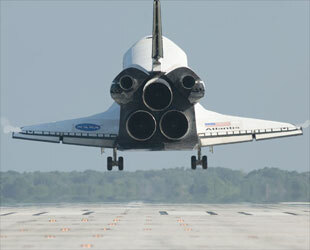 "If this ends up being space shuttle Atlantis' last flight, we have got an American flag that we are honored to fly. This American flag flew on Atlantis' first flight, STS-51J." In addition to the flag and the vehicle itself, Atlantis' final mission was also linked to its first flight through one of the two solid rocket boosters that launched STS-132. The aft dome on the left booster was first used to loft STS-51J. Atlantis' maiden mission commander, Karol "Bo" Bobko, said those connections were special. "I definitely have an emotional tie with Atlantis," he said in an interview with collectSPACE. "I am certainly proud of having flown the first flight of Atlantis, it was a great bird." Atlantis' prior crew members aren't the only ones however, paying tribute to the vehicle. Its launch team at Kennedy Space Center in Florida recently revealed a mural marking Atlantis' milestones. 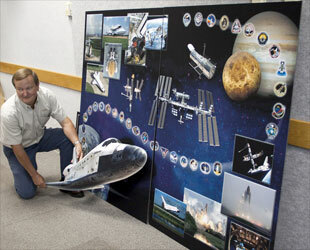 "We have a new display on the wall of the firing room for Atlantis," said launch director Mike Leinbach. "It is a very beautiful mural of some of the highlights of Atlantis' career along with every mission patch." 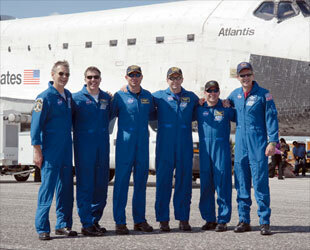 "The whole team has been involved with Atlantis since its first mission in 1985," he said. "She's been around for a long time. A lot of us have known that ship for 25 years." First Atlantis mission; dedicated to Department of Defense. Classified mission; dedicated to Department of Defense. Deployed Magellan probe to Venus. Deployed Galileo probe to Jupiter. Deployed Compton Gamma Ray Observatory. Carried Atmospheric Laboratory for Applications and Science (ATLAS). Deployed European Retrievable Carrier, Tethered Satellite System. First shuttle docking with Russian space station Mir. Carried docking module to Mir. Rendezvous with Mir, including crew transfer. International Space Station assembly mission (resupply). International Space Station assembly mission; delivered Destiny laboratory. International Space Station assembly mission; delivered Quest airlock. International Space Station assembly mission; delivered S0 truss segment. International Space Station assembly mission; delivered S1 truss segment. International Space Station assembly mission; delivered P3/P4 truss. International Space Station assembly mission; delivered S3/S4 truss. International Space Station assembly mission; delivered Columbus lab. Fifth and final servicing mission to the Hubble Space Telescope. International Space Station assembly mission; Mini-Research Module-1.